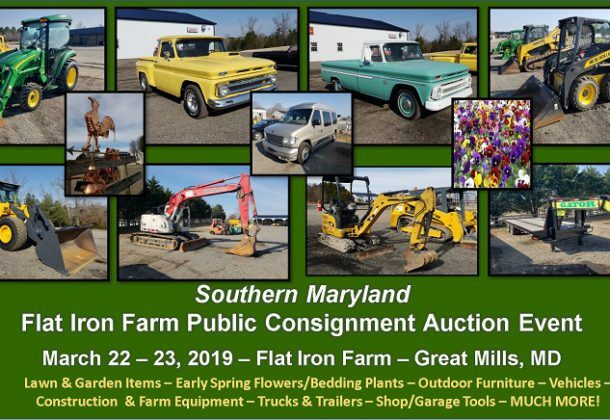 The Flat Iron Farm two-day auction will be held Friday and Saturday, March 22 and 23, 2019, at the farm in Great Mills, Maryland. J.G. Cochran Auctioneers & Associates LTD and Farrell Auction Service LLC will be hosting the auction for the farm. Auctions will begin at 8 am both days. There will be tons of great industrial equipment at this public consignment auction including farm equipment and attachments, trucks, trailers, lawn and garden items, lawn mowers, ATVs, county vehicles, early spring flowers and bedding plants, shop and garage tools, and much, much more. More information will be available at a later date. Hundreds of items have already been received and many more are expected. Need horse-related tack? The auction will have that, too. Lead ropes, blankets, halters, water and feed buckets, manure forks, tack hooks, and more. Have similar items you want to sell? Bring it on! Organizers urge you to get your consignments in early. Both days of the Flat Iron Farm two-day auction are open to the public, and anyone can buy or sell. Flat Iron Farm is located at 45840 Highway to Heaven Lane off Flat Iron Road, Great Mills, MD 20620. Call 301-994-1306 for information. For information on the March 22 and 23 auction, visit this site. For more information on Great Mills Trading Post, visit its Leader member page.